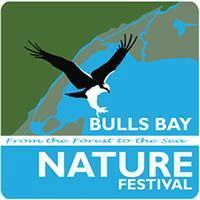 Bulls Bay community agencies, organizations and businesses come together once again to bring you the 3rd Annual Bulls Bay Nature Festival on Saturday, May 16th, 2015. The mission of the Bulls Bay Nature Festival is to increase awareness, promote engagement, and foster lasting connections with our unique natural places and wildlife in the Bulls Bay community. Festival events and activities will happen in the Francis Marion National Forest, the Cape Romain National Wildlife Refuge, Camp Sewee, Bishop Jerden Conference Center, Hampton Plantation State Historic Site, and at the Sewee Visitor Center. Activities include: bird, butterfly, and wildflower walks; historic tours of Hampton Plantation and Francis Marion National Forest; kayak paddles in the salt marsh and blackwater creeks, paddle boarding, and live wolf, reptile, and raptor programs plus the Back Porch Story Tellers! New this year: Edible and Native plant walks, Archery simulator, nature photography workshop at the Sewee Center! For the kids: archery, fishing, salt marsh explorations, nature art, red wolf masks, turtle hats, animal tracks, fish art, and face painting! The festival will include music, food, community and wildlife art exhibitions, and an address from our guest speaker, noted field biologist and author Dr. Richard Porcher. Singers and Musicians include Rut Leland and Friends, Graham Crolley Band, Awendaw Community Singers, Wendy Fisk & Commitment, Rene Russell and folk singer/guitarist Kathie Livingston. For a list of 2015's activities please visit the activities page! Key Note Speaker Dr. Richard Porcher5 p.m. "Botanical Potpourri" - The Lowcountry is rich in plant species! Berkeley County SC is known for its vast diversity of plant species, noted to be around 2500 species. More than 1600 plant species have been recorded in the Francis Marion National Forest alone, much of its acreage within the County. Dr. Richard Porcher has spent decades studying the natural history and ecology of these landscapes, having identified over 400 of the wildflower species in their habitats. Not only does Dr. Porcher identify the plants but he has written about their folklore as well, noting the economic and cultural uses of many of the species. Flowering trees, shrubs, woody vines, herbs, showy herbaceous plants or “weeds” – they are all part of the potpourri mix. Dr. Porcher ignites our interest and enriches our lives with the beauty of this landscape. Many if not most of us refer to his books, Wildflowers of the Carolina Lowcountry and Lower Pee Dee and A Guide to the Wildflowers of South Carolina to identify plants we find on our walks in the forests or along the beaches. Youth Exploration of Rotten Logs - Who lives there?